As the name implies, red wine vinegar is made from red wine, though the final product is nonalcoholic. The vinegar is acidic and is often used in salad dressing and marinade recipes. Beyond trace amounts of certain nutrients, red wine vinegar offers a variety of other potential health benefits. Red wine vinegar is very low in calories and doesn't contain any fat. Using the vinegar on foods such as tossed green or pasta salads adds a burst of flavor without adding large amounts of fat and calories. Keeping your intake of saturated and trans fats low is one step you can take to improve your overall health. 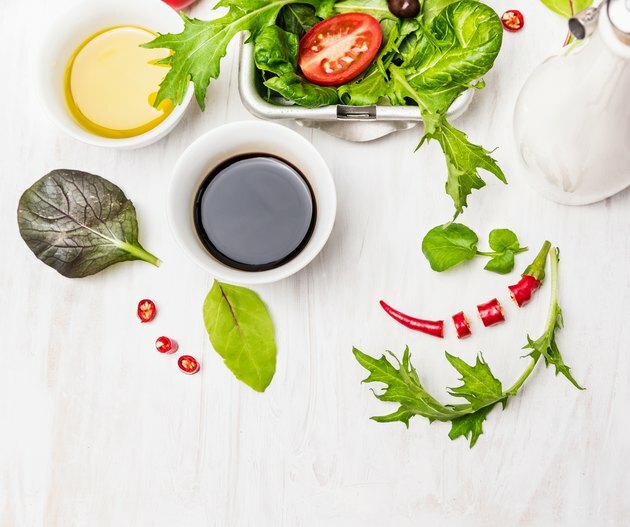 For example, using red wine vinegar in place of salad dressing or in place of mayonnaise in pasta salad is a simple, but flavorful way to cut your intake of calories and saturated fat. Read More: Can a Tablespoon of Red Wine Vinegar Before Bed Really Help You Lose Belly Fat? A 1-tablespoon serving of red wine vinegar doesn't supply huge doses of any nutrients, but it does contain trace amounts of several key vitamins and minerals. For example, a tablespoon of red wine vinegar contains tiny amounts of iron. This mineral helps your body make red blood cells and helps to prevent anemia, a health condition that causes fatigue and weakness. A tablespoon of red wine vinegar also contains trace amounts of calcium, magnesium, phosphorus, potassium and vitamin C.
Because red wine vinegar is essentially sour red wine, it contains resveratrol, which comes from the skin of grapes. Mayo Clinic says resveratrol might help prevent damage to blood vessels, reduce LDL cholesterol and prevent blood clots. Red wine vinegar can also contain polyphenols, which are compounds from plants that act as antioxidants to reduce cell damage caused by environmental factors. Research has indicated that polyphenols may lower the risk for type 2 diabetes and may boost insulin sensitivity, as well as slow down the rate the body digests and absorbs sugar. The purpose of a study, published in Oxidative Medicine and Cellular Longevity in 2017, was to investigate the link that dietary polyphenols might have on diabetes. Using red wine as one of the sources of polyphenols, the findings concluded that vinegar may improve blood glucose response which could be beneficial for both insulin resistance and type 2 diabetes. Read More: What Are the Benefits of White Wine Vinegar? Vinegar may have other health benefits due to organic acids, including acetic acid, the main component of red vinegar. Researchers studied a variety of vinegar products and their therapeutic effect and functional properties. Conclusions of the study, published in the Journal of Food Science in 2014, suggested vinegar had potential health benefits that included antibacterial activity, blood pressure reduction, antioxidant activity, reduction in symptoms of diabetes and prevention of cardiovascular disease. In addition to making tasty salad dressings, you can use red wine vinegar as an ingredient in meat marinade recipes, or add a splash to a bowl of soup or chili to achieve a bold flavor. Marinate vegetables, such as mushrooms or shallots, in red wine vinaigrette to benefit from the enhanced flavor. You can also drizzle red wine vinegar over grilled shrimp or scallops or stir a tablespoon into gravy for meat and potatoes.